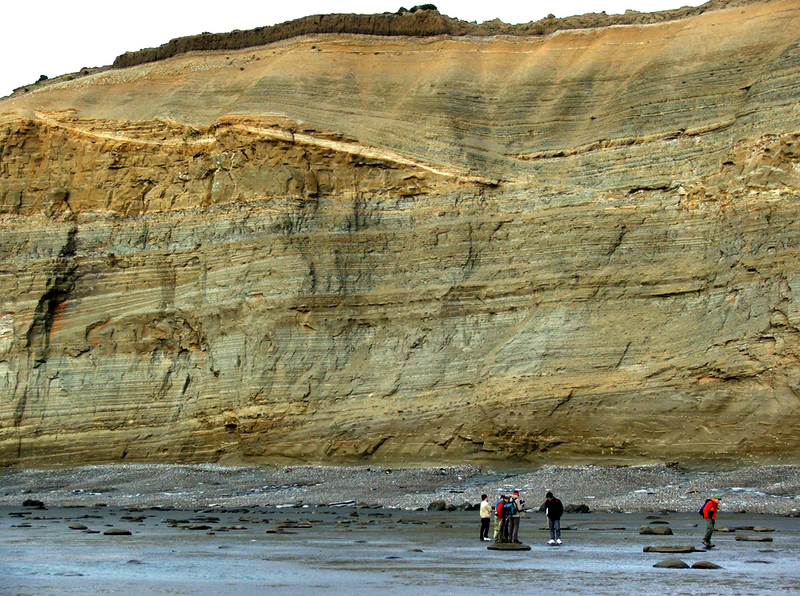 This week’s Friday Field Foto is from some Miocene beach-cliff exposures on the Atlantic coast of Tierra del Fuego. These sandstones are characterized by a mix of ‘normal’ turbidites thick successions of traction-dominated (including large climbing dunes) deposits. Also note the surface cutting down from left to right in upper part of cliff — a nice erosional surface, which is overlain by mostly thin-bedded, fine-grained strata. Spectacular exposure! At first I thought that it was a remarkable roadcut, but then I panned down to the bottom and saw the scale in the foreground (and finally I read your description). Wow! Is the access only at low tide? This is a good picture in deep water sedimentary.Early thin mud sediments were eroded by river channel or turbidite channels. Then deep lake sediments deposited.